It's Sustainable, it's Stylish .. it's STRAWBALE! It's ... a Fairytale House come true! After many years of living and working in Melbourne, and dreaming of developing a country property from scratch, our dream became a reality in 1991 with the purchase of a 20 acre "rabbit infested" paddock, high in the Sedgwick ranges at Harcourt North - just 1 ½ hours north west of Melbourne & 25 minutes south of Bendigo. The granite hills and spectacular views which overlook a sheltered, fertile valley, were the main attraction to the block. The property originally boasted just fifteen trees being beautiful 200-year-old gums. Twelve years on, the original 20 acres, plus an adjoining 15 acres purchased, is home to approximately one thousand trees and numerous species of birds that have returned to the area, along with the occasional possum, terrapin, echidna and kangaroo. For the next couple of years after purchasing "MillDuck", we continued to work in Melbourne and spend every possible weekend developing the land. In the cold depths of July 1994, the transition to the country was made, leaving behind central heating and, luxuries such as internal toilets - to begin 6 ½ years as "Shed Dwellers". We reflect on our time in the non-insulated colourbond shed with affection, it gave us an increased appreciation of the environment and its weather patterns. 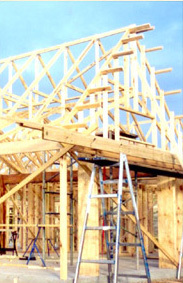 This valuable information was incorporated in the selection of the house site, the house design and building materials. For example, from living on site, we learnt that winds can, at times, come from any direction therefore the house design had to incorporate "nooks and crannies" to be able to escape the wind for Sunday BBQs. A high priority for the house, due to the site being very exposed, was that it needed to have minimal upkeep. As well, the colour chosen, which goes in the final coat of render, had to blend in with the environment. Being environmentally aware and conscious of potential erosion in the granite hills were some of the underlying reasons for purchasing the soft-padded alpacas, however, their irresistible characteristics, low maintenance and ability to produce elite fleece were the main reasons for establishing our MillDuck Alpaca Stud. 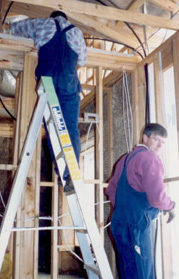 A Continuing Education course on Passive Solar Design & Energy Efficient Housing strengthened our resolve to build a home that not only compliments the environment, but also conserves energy. Friends recommended an architect who believed strongly in these principles. Thus began the journey with Helen Bernard of "Imagine Strawbale Constructions" in Daylesford. We found Helen to have excellent listening skills. She listened to our passionate dreams & encouraged us to give her a "wish list" which ended up more than 3 typed pages of bullet points. It was during one of the initial meetings when discussing building mediums, that Helen suggested "strawbale". Whilst initially sceptical, we agreed to Helen showing us a strawbale house she and her partner Per had designed and built. We can still remember that day .. as soon as we entered the house we both knew it was what we wanted! It was a number of things - the overall calm feeling, the thick walls and deep windowsills, the versatility to reflect an individual personality. 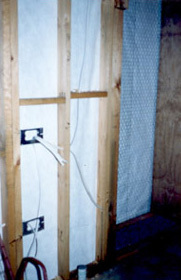 We were able to have walls with "soft corners". 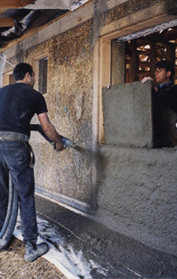 Strawbale also works so well with other building mediums such as timber, brick, and stone - we were hooked! That's not to say we didn't go through the usual doubts of . Will it burn down? . What if mice get in the walls? . 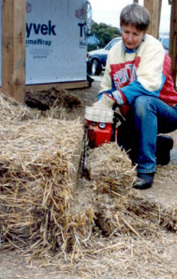 will the strawbales disintegrate over time? . Will we be able to get council approval and house insurance?" However, after substantial research, our fears dissipated and the building process began. STRAWBALE HOUSES DO THEY REALLY WORK? After living in our strawbale home since December 2000, we believe it to be FANTASTIC!! We would always want to live in a well-designed strawbale house, if given the choice. The thermal properties are excellent. Because we're interested in the effects of living in a strawbale house, we have, for the first two consecutive years, monitored the minimum & maximum daily temperatures, taken inside the house as well as outside in the shade, under an easterly veranda. It's both warmer in winter & cooler in summer. 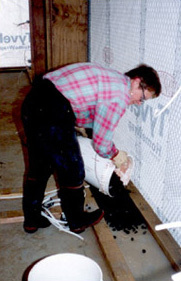 For example - in July 2002, the average minimum temperature out side (measured over 24 days) was 3°, while strawbale construction provided the insulation factor to lift that minimum temperature in side, to 15°. We always try to keep the temperature around 20°. We are happy with our average sized, cast iron wood heater which we only need to have on during the evenings, hardly ever during the day." 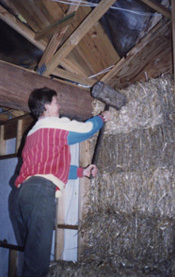 Another example of the advantages of Strawbale - In the middle of December 2002, we had 7-consecutive days of high temperatures. The outside average, for the 7 days was 36° with the hottest day being 40°. The equivalent in side temperatures saw an average of 26° with the hottest measurement being 28°." It is important to put in context that these results have been achieved without any kind of air conditioning or cooling system. The windows and glass sliding double doors (north facing) in the open living space where the temperatures are monitored, are single glazed and due to the exceptional views, do not have any form of coverings. It is therefore not surprising to learn that this Strawbale Home and Bed & Breakfast won the 2002 Master Builders Association Award for the "Most Energy Efficient Home" in the North West Region of Victoria along with the "Best Custom Home" award in its respective price bracket. We find our strawbale home to be a very "calm" house to live in with evenness in temperature throughout the rooms. 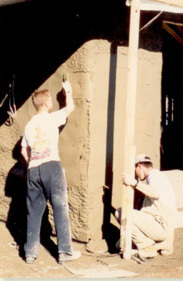 The textured walls that follow the contour of the bales, along with the niches (shallow recess cut into the wall to contain a small object) have given this house and the Bed & Breakfast accommodation a warm uniqueness, which compliments the environment. ​House Tours (1-2 hrs): Informative house tours (Max. 6 people, not suitable for children) allow you to learn about passive solar design aspects & techniques while “in situ” - in a strawbale house. Theory is backed up by temperature records which have been recorded over a 2 year period, comparing the minimum & maximum indoor and outdoor temperatures. A printed handout ensures the salient points of interest are covered. Participants are encouraged to take photos, ask questions & take an active part throughout the discussion. Cost*: $35 pp, minimum 2 people, by prior arrangement. *B&B guests who are building or interested in building a strawbale or sustainable house – Free if staying 2 nights.